Open your mind to the emerging field of research that suggests diet may have a powerful impact on brain health and function. My Aunt Prussia, with her cat-eyed glasses, bright red lipstick, and neat black updo, used to cook up the meanest batch of scrambled eggs and bacon for breakfast in her country kitchen in Yakima, Wash. Over breakfast, she spun tales of her childhood growing up in the South, with her young nieces and nephews lined up to listen. But then she started forgetting her stories, even though her body was as strong as ever. She paid her bills twice, lost her favorite jewelry, and couldn’t find her home in her own neighborhood. Aunt Prussia eventually ended up in a long-term care facility, along with hundreds of other patients with Alzheimer’s disease (AD), where she would not even recognize her friends and family who came to visit. Most families have been touched by a similar story of the devastating effects of age-related neurodegenerative diseases such as AD. Watching the essence of a loved one’s life slip away, day by day, is a heart-wrenching experience—and it’s a costly one, too. The economic impact of a projected 8 million people with AD in the United States by 2030 will be roughly $500 billion. A neurodegenerative disease is a disorder caused by the deterioration of neurons. Changes in these cells cause them to function abnormally, eventually bringing about their death. The neurodegenerative diseases AD, Parkinson’s disease (PD), Creutzfeldt-Jakob disease, and multiple sclerosis occur due to neuronal degeneration in the central nervous system. Current treatments for neurodegenerative diseases have proven inadequate thus far. AD is the most common cause of dementia among older people. Scientists have much to learn about the cause of AD, an irreversible, progressive brain disease that slowly attacks memory and thinking skills, eventually leading to the affected individual’s inability to perform simple activities of everyday life. AD is marked by changes in the brain that include neurofibrillary tangles in the entorhinal cortex, amyloid plaques, and the loss of connections between neurons in the brain. These lead to widespread damage in the brain tissue. However, there is new hope on the horizon for neurodegenerative diseases in the form of lifestyle modification. David Perlmutter, MD, FACN, a board-certified neurologist, a fellow of the American College of Nutrition, author of The Better Brain Book, and the director of the Perlmutter Health Center in Naples, Fla., is an internationally recognized expert in the field of nutrition and neurological disorders. Perlmutter, who presented at the Fifth Annual Nutrition and Health Conference: State of the Science and Clinical Applications in April 2008, believes that AD is preventable. He reports that in recent years, there has been growing scientific support for the roles of both inflammation and free radical activity in brain functional decline across the spectrum of neurodegenerative diseases. Though the cause of neurodegeneration appears to be multifactorial, lifestyle choices may play a big role in reducing inflammation and free radical-induced neuronal damage as part of preventive medicine in brain health. Perlmutter puts his theories into practice at the Perlmutter Health Center, where complementary health approaches, including nutritional therapy, are combined to create an integrated treatment plan designed for the individual. While Perlmutter treats a number of chronic diseases at the center, his skills are particularly valuable for patients who visit the center with neurological problems such as headaches, epilepsy, stroke, PD, dementia (including AD), myasthenia gravis, multiple sclerosis, amyotrophic lateral sclerosis, dystonia, other movement disorders, and neuropathy. Slow, smoldering inflammation in the brain appears to play a big part in neurodegenerative diseases. Inflammation is characteristic of all neurodegenerative conditions and paves the way for free radical activation, explains Perlmutter. Recent findings indicate that the activation of microglia (tissue macrophages in the central nervous system) in response to injury, illness, aging, or other causes begins a cascade of events that can be characterized as an inflammatory process, according to a 2006 article in The American Journal of Clinical Nutrition. This cascade is mediated at first by the proinflammatory cytokine interleukin-1, which is overexpressed by the activated microglia. Through various pathways, interleukin-1 causes neuronal death, which activates more microglia, which in turn releases more interleukin-1. Over time, this ongoing inflammation in the brain destroys enough neurons to cause the clinical signs of AD. According to an article published in a 2005 issue of The International Journal of Biochemistry & Cell Biology, inflammatory components related to AD neuroinflammation include not only microglia but also astrocytes (star-shaped glial cells of the central nervous system), the classic and alternate pathways of the complement system, the pentraxin acute-phase proteins, neuronal-type nicotinic acetylcholine receptors, peroxisome proliferator-activated receptors, and cytokines and chemokines. Both the microglia and astrocytes have been shown to generate beta-amyloid protein, one of the main pathologic features of AD. The neuroinflammation connection may be glimpsed through studies linking anti-inflammatory drug use and lower AD risk. Perlmutter points to a 1997 study published in Neurology that examined the effects of nonsteroidal anti-inflammatory drugs (NSAIDs) on AD risk. “The patients who took NSAIDs for two or more years had a significantly lower risk of Alzheimer’s disease,” says Perlmutter. Indeed, the researchers concluded that the evidence suggests that one stage of the pathophysiology leading to AD is characterized by an inflammatory process. Other studies have also concluded that NSAIDs appear to protect against AD, as well as PD. Additional research is necessary before recommendations can be made for people to take NSAIDs to keep neurodegenerative disease at bay. The impact of oxidative stress on the brain is another crucial area catching researchers’ attention. Scientists have noticed that patients with AD tend to have lower antioxidant status. And now studies have shown oxidative damage to lipids, proteins, DNA, and RNA in multiple brain regions in late-stage AD, according to researchers from the University of Kentucky in a 2007 Archives of Neurology study. Recent autopsy findings on study patients with amnestic mild cognitive impairment demonstrate that oxidative damage may be an early event in the pathogenesis of AD. The researchers suggest that better antioxidants and agents used in combination to upregulate defense mechanisms against oxidation will be required to neutralize the oxidative component of the pathogenesis of AD. Perlmutter sums it up: Neurodegenerative diseases represent the downstream effects of excessive free radical activity, supporting antioxidant approaches to brain protection and functional enhancement. 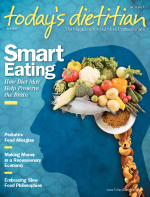 How can people practice smart eating to protect the brain from neurodegenerative disease? Perlmutter suggests several nutritional approaches that show particular promise. Humans once ate a diet rich in the brain’s principal omega-3 fatty acid, DHA, but now our intake is less than 100 mg/day. A growing body of research links DHA with brain health. Epidemiological data indicate that DHA may be associated with a reduced risk of AD, while observational studies have found that lower DHA status is associated with an increased risk of AD. Data from several animal models support the hypothesis that DHA may be an effective treatment for AD because of antiamyloid, antioxidant, and neuroprotectant mechanisms. A National Institutes of Health-funded, randomized, double-blind, placebo-controlled trial on the effects of DHA in slowing the progression of AD is currently underway. Long linked with longevity in mammals, calorie restriction may protect against neurodegenerative pathology, according to Perlmutter. Calorie restriction induces sirtuins, silent information regulator proteins that regulate life span, enable DNA repair, protect DNA, and improve the survival of neurons. Researchers from the Mount Sinai School of Medicine used an experimental mouse model to demonstrate that beta-amyloid peptides in the brain can be reduced by subjecting the mice to dietary caloric restriction, primarily based on low-carbohydrate food. Conversely, a high caloric intake based on saturated fat was shown to increase levels of beta-amyloid peptides. The study, which was published in a 2006 issue of The Journal of Biological Chemistry, suggested that caloric restriction through the promotion of the sirtuin SIRT1 may activate alpha-secretase, which can prevent AD amyloid neuropathology. “Fasting spans all religions and cultures. We are learning that this may be powerful,” adds Perlmutter about the potential brain benefits of calorie restriction. Additional research needs to further clarify the role of calorie restriction in neurodegenerative disease. The most abundant antioxidants found in the diet, polyphenols have shown neuroprotective effects in studies over the past decade. Researchers have found that these plant compounds are able to protect neuronal cells in various in vivo and in vitro models through different intracellular targets. It appears that the mechanisms of action for dietary polyphenols extend beyond their antioxidant activity. For example, researchers from the USA National Parkinson Foundation Centers of Excellence for Neurodegenerative Diseases Research and Department of Pharmacology and the Rappaport Family Research Institute in Israel report that green tea catechin polyphenols, thought to be simple radical scavengers, are now considered to promote a spectrum of cellular mechanisms of action related to neuroprotective activity. These include activities such as iron chelation, scavenging radicals, activating survival genes and cell signaling pathways, and regulating mitochondrial function and possibly of the ubiquitin-proteasome system. The compound that lends the popular Indian spice curry its bright-yellow color may have the power to protect against AD, according to UCLA researchers. India, where curcumin is consumed regularly, boasts one of the lowest rates of AD in the world. Curcumin appears to slow the formation of—and possibly even destroy—accumulated plaque deposits at the root of AD. Curcumin significantly lowered oxidized proteins and interleukin-1beta, a proinflammatory cytokine, in Alzheimer transgenic mice brains, according to a 2001 study in The Journal of Neuroscience. Greg Cole, PhD, a professor of medicine and neurology at UCLA, who has studied the effects of curcumin on AD, reports that curcumin is a potent antiamyloid drug with an established safety profile that has reversed cognitive defects in animal models. With the power to squelch oxidative damage associated with neurodegeneration, antioxidant vitamins may become an important strategy for neurodegenerative disease prevention. A 2004 study in the Archives of Neurology found a reduced risk of AD in users of antioxidant vitamin supplements. The study included 4,740 participants aged 65 and older assessed between 1995 and 1997 and 1998 and 2000 for the use of multivitamins and vitamins C and E, finding that the use of both vitamins C and E was linked with a 78% reduced prevalence of AD. In addition, high serum levels of the antioxidant beta-carotene was associated with an 89% reduction in risk of cognitive decline in subjects heterozygous for the apolipoprotein E 4 allele (indicating greater genetic susceptibility for cognitive decline), according to a 2006 study in The Journals of Gerontology. Researchers believe that coenzyme Q10, a fat-soluble compound primarily synthesized in the body and also consumed in the diet, may have the potential to affect the course of neurological disease in which mitochondrial function is impaired and oxidative stress and damage are present, according to a 2001 article in Neurology. Coenzyme Q10 is required for mitochondrial ATP synthesis and functions as an antioxidant in cell membranes and lipoproteins. A 16-month, randomized, placebo-controlled trial published in the Archives of Neurology in 2002 investigated the effects of coenzyme Q10 on early PD. In 80 untreated subjects with PD, placebo or coenzyme Q10 was provided at 300, 600, or 1,200 mg/day. Coenzyme Q10 supplementation was well tolerated at all doses and associated with slower deterioration of function in patients with PD compared with placebo. Additional research is needed to confirm these results. Along with a host of disease-prevention benefits, the Mediterranean diet has also been linked with a lower risk of AD. Scientists from Columbia University reported findings on the Mediterranean diet’s effects on AD in a 2007 issue of the Archives of Neurology. In a case-control study in a New York community-based cohort, researchers discovered that higher adherence to the Mediterranean diet was associated with a lower risk of AD, possibly due to the reduction in inflammation and an antioxidant effect. While nutritional strategies that reduce inflammation and oxidative stress appear to hold promise for preventing neurodegenerative disease, it’s important to note that some nutritional factors may actually enhance brain inflammation. Obesity seems to be on the top of the list of concerns. Studies have shown that people with higher levels of adiposity are at higher risk for both future PD and AD and that central adiposity is related to cognitive decline and dementia. “Body fat promotes inflammation. Body fat may store toxins. A fatter person even has a smaller hippocampus,” says Perlmutter of links between obesity and neurodegeneration. Diabetes is linked with a higher risk of dementia and AD as well. Brain inflammation may also be bolstered by advanced glycosylation end products (AGEs), molecules formed during a nonenzymatic reaction between proteins and sugar residues called the Maillard reaction. AGEs produce a “fifty-fold increase in free radicals and increase the risk of AD by 400%,” according to Perlmutter. AGEs can create adverse effects on tissues and cells, including the activation of intracellular signal transduction pathways leading to the upregulation of cytokine and free radical production. Celiac disease may also be an underestimated pathway to dementia. With celiac disease historically flying below physicians’ radar, the potential damage to the brain of someone with uncontrolled celiac disease has worried neurologists. A possible association exists between progressive cognitive impairment and celiac disease due to the temporal relationship and the high frequency of ataxia and peripheral neuropathy commonly associated with celiac disease. Perlmutter suggests that celiac disease screening be on the panel for dementia testing. The field of brain regeneration may seem like the stuff of science fiction, but it’s already happening in research labs today. The old thinking went along the lines that neuron loss was irreversible in the adult human brain because dying neurons cannot be replaced. The inability to create replacement cells is considered a primary factor in neurological disease and impairment. Yet, Swedish scientists treating human brain tissue obtained postmortem from patients treated with bromodeoxyuridine, a thymidine analog that labels DNA during the S phase, were able to demonstrate that new neurons are generated from dividing progenitor cells in the dentate gyrus of adult humans. These results, reported in Nature Medicine in 1998, indicate that the human hippocampus retains its ability to generate neurons throughout life. In a 2004 study published in the Journal of Neurotrauma, UCLA researchers investigated the effects of dietary omega-3 fatty acid supplementation to help the brains of rats cope with the effects of traumatic injury. The results indicated that omega-3–enriched dietary supplements can provide protection against reduced plasticity and impaired learning ability after traumatic brain injury. DHA has also been linked with slowing the progression of AD in recent research, demonstrating that it plays a pivotal role in mitochondrial and neuronal membrane fluidity, signal transduction, neurogenesis, gliogenesis, and synaptogenesis. The smart lesson to be learned about brain health and function? Don’t neglect nutrition.